An all party committee will be set up to put forward proposals to replace the current Preference Vote system and replace it with an Mixed Electoral System that ensures representation of individual Members for Parliamentary Constituencies, with mechanisms for proportionality. Independence Day will be celebrated with re-establishment of Democracy and Good Governance and the Sovereignty of the People. Parliament will be dissolved and free and fair elections held under a caretaker government. Following that election, the Prime Minister will be appointed from the party getting the highest number of seats at such election, with a Deputy Prime Minister from the party getting the next highest number. Under that government a National Policy Framework will be formulated to deal with the principal challenges the country faces, and a political culture will be developed to act in accordance with that Framework. The nation is suffering from authoritarianism, and decisions taken by a few family members with no consultation of or care for the people. The destruction of ethical and socio-cultural values has led to grave suffering, through massive waste and abuse and corruption and absolute impunity. We need therefore to provide immediate relief to those who are oppressed, and embark on social and economic reforms that will restore normalcy and lead to prosperity for all. Full relief will be provided on the loans given to public servants for the purchase of motor cycles. Those who have paid previously will be refunded. Graduates from whom virtual slave labour is obtained will be given regular appointments in a systematic fashion, and opportunities for promotion will be provided in accordance with suitable criteria. An allowance of Rs 5,000 will be paid to pensioners, pending adjustment of anomalies in pensions. Rs 1 million of the deposits in State Banks of each pensioner will receive interest of 15%. The Samurdhi Allowance will be increased to 200% of the present rate to a maximum of Rs 2,000. Pregnant mothers will be given an allowance of Rs 20,000 to supplement nourishment. Excessive taxes will be lowered to reduce prices on ten essential food items. At the same time, special provisions will be put in place for protection of those producing such goods locally. The current excessive taxes on fuel, amounting to around Rs 40 billion a year, will be removed and the benefits of this reduction in cost will be passed on to consumers. The efficiency of both state and private transport services for the public will be improved through providing appropriate incentives to the transport sector. The price of a cylinder of domestic gas will be reduced by Rs 300. The guaranteed purchase price for a kilogramme of rice will be Rs 50. The guaranteed purchase price for a kilogramme of potatoes will be Rs 80. The guaranteed purchase price for a kilogramme of tea leaves will be between Rs 80 and 90. The guaranteed purchase price for rubber will be Rs 350 per kilogramme. The guaranteed purchase price paid to dairy farmers for a litre of milk will be raised by Rs 10 from the present Rs 60. Relief of 50% will be provided on loans taken by farmers, and the remainder will be compounded to allow for payment on easy terms. A new pensions scheme will be introduced for farmers and fishermen. A pensions scheme will be introduced for Three Wheeler Drivers, Masons and Carpenters and those engaged in small scale retail trade and other informal occupations. A pensions scheme will be introduced for migrant workers, and the interest on their NRFC deposits will be increased by 2 ½%. Measures will be put in place to protect those of all races widowed during the conflict, and their families. So as to increase the participation of women in political decision making, legislation will be introduced to ensure at least 25% of women’s representation in Provincial Councils and Local Government bodies. Those engaged in Small and Medium Industries who have fallen into a debt trap and been blacklisted by CRIB, and those who suffer the same because of credit card debts, will be relieved from this through an easy repayment scheme. Instead of the hijacking of the economy by a few individuals engaged in deals with regard to casinos and drugs and ethanol, we will develop a national business sector working towards the prosperity of the country, in particular by establishing schemes of credit on easy terms for Small and Medium Enterprises. We will set out to raise to 3% the current 1.8% allocated for the free Health Service. All drugs needed by patients attending government hospitals will be made available without shortages in those very hospitals. An intensive programme will be implemented to swiftly get through the waiting lists for patients at government hospitals. Government hospitals will offer services to out patients until 10 pm every day. We will put a stop pending investigation into import of fertilizer and chemical substances suspected of contributing to kidney disease, while immediately preparing plans for short term and long term measures to deal with the problem, and ensuring their implementation. Pictorial warnings with regard to the dangers of smoking will be increased to 80%. Powers with regard to universities which are now exercised by the Minister will be restored to the universities through the University Grants Commission, and the politicization of the universities will be halted. Mahapola scholarships at universities will be raised to Rs 5000. A fair scheme for admission to Grade 1 will be instituted and implemented transparently. Those who have suffered from abuse in this regard will be provided with immediate relief. Measures will be taken to revive the European Union market from which our fish is now being excluded. A Meteorological Inquiry service will be established to provide accurate information immediately to fishermen with regard to storms and other dangers. Immediate steps will be taken to repair irrigation channels that have fallen into disuse. Immediate steps will be taken to clear up reservoirs that have silted up. Outlets for alcohol will be removed from the vicinity of places of religious worship ncluding the Temple of the Tooth, and car races in those areas will be stopped. Proposed amendments to the Buddhist Temporalities Act will be finalized after consultation of the Heads of Buddhist Orders to obtain their advice and guidance and approval. Their positions and rights will be restored to victims of political revenge and punishments, including former Army Commander General Sarath Fonseka, and 43rd Chief Justice Shirani Bandaranayake. Imagine Sri Lanka without MR’s face on signs placed on every single junction in this country no matter how small the road. The idea alone makes me sigh of relief! Sounds like Sri Lanka might be that paradise after all. If Sirisena is smart, he keeps flirting with the Chinese (but keep them in the South) while flirting with India in the north. 300 million customers in South India alone. And thousands of diaspora eager to invest. A flirt with both super powers is creating healthy competition! It’s going to be alright with mother Lanka! This man Sirisena is asking for trouble. Other measures in his agenda has the necessary impetus for the ruling clan and its cronies to work harder to prevent this man becoming the next president in order to protect their vested interest. The next day after Thursday April 23 the business of governing will be as usual as they were the day before January 8th 2015. What is so bad in getting RW appointed as PM during that short period? There is nothing wrong in getting the input of political representatives during the interim period. Please do not humiliate the Vadda community with your shortsighted comment. Please re read my comment. Great. Let us look forward to a peaceful environment where corruption is eliminated and all are equals in the country. Not all corruption will be eliminated, But there will be less corruption compared to Rajapaksa’s regime. Oh looks like a mini peoples friendly budget. Corruptions will go the lowest level and the public very happy. Also reduce the number of holidays. We need discipline not crime and thuggery; we need the independence of the judiciary and rule of law and not its politicization and subversion and this must begin with every single person who stands for political office beginning with presidential candidates. This requires that every public official perform his or her duty while being subject to supervision and monitoring and being called to account for any deficit or excess or corruption. The incumbent is quite obviously beyond redemption. If the common opposition candidate wishes to be viewed as a credible alternative then he MUST apologize for having interfered with the law in order to prevent his son and his sons friends from being prosecuted for assault. He must publicly guarantee that he will personally ensure that the law takes its due course in respect to this incident and his rowdy sun and friends are all duly punished and the DIGNITY OF THEIR VICTIMS RESTORED! If he fails to do so not one single person who subscribes to the South Asian commitment to the rule of law will give him their vote. We need an apology from the common candidate for his past interference with the law and an assurance that he will abjure the prevailing culture of impunity and guarantee that the rule of law will be applied to every citizen including himself and his son and the rest of his kith and kin and that no one by virtue of holding public office will be beyond the reach of the law or its requirements or protected from punishment. If this apology and guarantee is not made public within forty eight hours, a campaign to expose every single political aspirant who has engaged in the subversion of the law and the protection of criminals will commence and escalate until it takes precedence over the presidential election itself. I do not want to be ruled by criminals any more do you? I have had enough of the culture of impunity have you? I have had enough of the double standards on human rights practiced by the USA and its admirers have you? I have had enough of the cynical subversion of discipline and justice by the philosophy of “shape” have you? I have had enough of the marginalization of and violence against religious and ethnic minorities have you? Then lets us insist on due process and let this aspirant to leadership begin with his apology and guarantee if he wants our endorsement and our votes. What a stupid 100 day joke ! cabinet of no more than 25 members, that is for 100 days after that it could be 100. People want to know after April 23rd what is the size of the cabinet for the next 5 years. How the hell he say, this and that will be passed in the parliament while the opposition holding 2/3 majority ?? All these promises is just for 100 days, After April 23rd there is no guarantee these things will be implement. Can he give a pledge that these things will be implement by the new government for next 5years?? If somebody else become the prime minister then they will have their own agenda. This 100 day thing is the most outrageously ridiculous plan to deceive people. Hope people will realise it before it’s too late!!! Sounds like dumb Namal ? I’d like to suggest that two days prior to Thursday February 5th, the biggest toilet in the country be outfitted with large glass windows and the Rajapaksa family and their bootlickers, cronies and hangers-on; the fraudulent CJ, the fraudulent police spokesperson, Vermyn, SB, Bandula, Azwer, Nimal Siripala and all their henchaiyyas and thuggish sons be invited (or frog-marched) in. Thereafter, the people be invited on Wednesday February 4th by gazette notification (or other suitable public proclamation) to come and relieve themselves to their hearts content into channels that will take the sludge and spray it on the inhabitants while the people watch from outside. To this end, a very small amount from the Rajapaksa slush fund be utilised to transport people from all over the country in CTB buses. Very innovative idea! I would suggest few more persons to be lodged in the pit. They are: present or past leaders of the party that killed Wijaya Kumaratunga, Premakeerthi, and attacked the Dalada Maligawa and also attacked the vital organs of Venarable Sumangala thero of JHU within the Parliament; the person who entertained himself by observing the torture of youth at Batalanda; the father of the young man who assisted by a posse of thugs assaulted a son of a SSP in Pasikuda and then protected the accused by interfering with the judicial and prosecution process and who says he comes with clean hands. All is good except appointing Ranil the traitor, British agent as Prime minister. Others, however possible or not are known to general public who wants change from this oppressive corrupt regime ever existed on this country. Even Mahinda Chintana had most of these promises although in practice was entire opposite! All good. Everything seems fine, but let’s not underestimate the cunning of the Rajapaksa’s. They will not go easily, if they lose. The immediate task at hand is to ensure this despotic, wildly corrupt family regime is defeated at the polls. To defeat Dictators at unfree and unfair polls is no easy task. History has shown us this e.g. Mugabe. Such rulers will do whatever needs to be done to ensure they will achieve their personal selfish goals. So the focus of the Opposition should be the campaign at hand and to implement strategies to counter every vile move of MR of which one can imagine. Do not be distracted by anything else. Once the victory is achieved, the pragmatic policies can be implemented in due course after consultation and consensus. To those sceptics I say, nothing can be worse than what SL is going through under this Demon. 2000 years ago, King Herod ordered that all babies be killed so that in the process baby Jesus will also be killed so his power will be secured. Similarly we have already seen signs that King MR will also resort to anything to ensure he remains in power. A head of State is expected to govern for ALL inhabitants. But unfortunately, in the last 5 years MR has governed for his family and a selected few. Voters do what is right for a more just and free society in SL. Any Sleep time for this hard working 225 MPs? Are the MPs , Ministers and Deputy Ministers who are in the current Bribery Commissioner’s cabinet going to cast their votes on these new Bills, Amendments, Special Orders and what ever else here?. Sira is not going to be in our New Port City, as he he has promised to demolish it with the Presidency .. .
Has the designated PM, Mr Ranil already organized High Speed Internet from Polonnaruwa to Kotte via Srikotha?.. . Are these the same type of gear which Ranil and CBK supplied to Prabakaran through Mr Solheim?. I mean you can’t give Dialogue Dongals to our MPs to carry out this massive programme in 100 days, without our Dalit Nerds tapping in to their highly secret hard drives..
How many of the Ministerial Jobs are assigned to the SLFP?.. I mean to be fair it should get the Lion’s share Right ?.. That is 23 in total . mind you 25 is the max.. So where is the room for Rathna , Abiththaya , Rajiva, and Rajitha?. Which some inhabitants might say the two most important issues of the of the day.if not the decade.. Along with salary raise for public servants, an increase in pensions of at least 50% should be given. Pensioners are struggling to exist while ex-parliamentarians and others of their staff,who completed only five years in ‘service’ have their pensions annually increased with increase in the Cost of Living. They can’t raise more than 50%, But they will give more salary instead of pension. Does anyone know the website where they track the progress of the 100 day program? I heard they have established a website for this purpose. Happy with the ideas.hoping that Muslims won’t be affected as before 08.01.2015 and by any sort of solution to other ethnic sri Lankans who should also be given proper solution to their long term existency as Islam says. Accumulating money in illegal way is haram for Muslims.I hope all Muslim parliamentarians should be investigated with their accounts irrespective of their current side as lot of differentces during the last four years is apperently seen . I would like to continue with all kind of sri Lankans in a brotherhood way as Islam says without any kind of terrorism which should be very closely monitored to assure the wellbeing of all the nations in sri Lanka. Congratulations to President Sirisena on his election to office. But what about bringing justice to the people of the North and East. They have suffered for far too long and they need to live in peace and freedom. 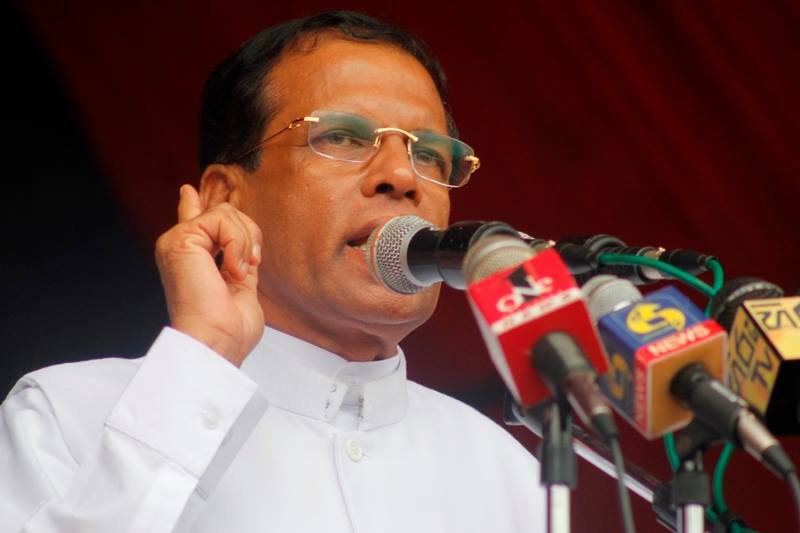 Sirisena should give the people a chance to decide what kind of political future they want. They must have their own referendum to decide their future.